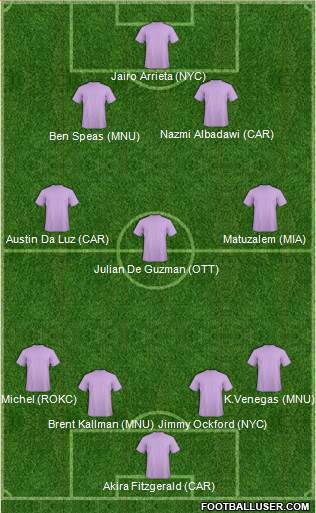 Last week’s Best XI was dominated by Carolina Railhawks and this week’s is no different. Although only Carolina and New York Cosmos stand with full six points from the first two matches of the season, the Cosmos had much easier opponents and were safely ensconced on their home pitch. Carolina is, unarguably, the best team in the NASL right now. The formation for last week’s team of the week was a 4-2-3-1, but given just how underwhelming the strikers across the league were again this weekend the Best XI formation moves to a 4-3-2-1. For week one, the league’s official team of the week gave too much love to a penalty kick (Miami’s Dario Cvitanich) and credit for a poor performance from a big name (Rayo OKC’s Michel). We also differed on the second centerback and central midfielder, but honestly both of the league’s choices (Ft. Lauderdale’s Gale Agbossoumonde and Tampa Bay’s Michael Nanchoff) played well and were deserving of notice. For this week, I suspect further divergent opinion. In his debut with his new team, leftback Michel was not especially on or impressive even though all of Rayo OKC’s attack was served up through him. On Saturday, however, Michel played the sort of match expected out of him. He pressed the Carolina defense throughout and was infinitely more dangerous than he had been seven days prior. In fact, the goal he scored to briefly take the lead was a wonderful bit of dribbling and finishing from an acute angle. Unfortunately, Rayo OKC’s first ever goal scored by Ryan Johnson and first ever lead was snuffed out by the Railhawks. A second assist from central attacking midfielder Nazmi Albadawi drew Carolina level again and then another game-winning header by left winger Austin Da Luz won the match in stoppage time. Rayo OKC did its best to harry a make-shift Carolina defense (due to injury and a red card in week one), but goalkeeper Akira Fitzgerald was able to weather the storm. Fitzgerald face a superior attack than the other strong performer at goalkeeper this week, Miami FC’s Daniel Vega, which is why I give him the edge. The Miami FC versus Tampa Bay Rowdies match was a slog, really no better a match than last week’s. However, Miami was able to bring out over 10,000 to watch its home opener compared to just barely 2000 for Ft. Lauderdale. Once Miami starts winning, one can only imagine what kind of attendance it could muster. Helping that along was right midfielder Matuzalem, his 93% pass completion and work on the defensive side of things got Miami dangerously close to a cleansheet victory. 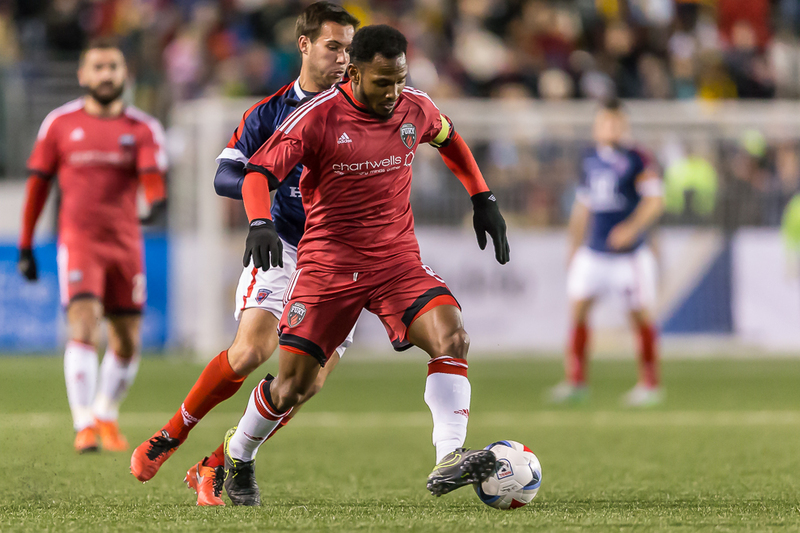 Similarly, the workrate out of the Ottawa Fury’s Julian De Guzman was one of the few bright spots in its draw in Indianapolis to Indy Eleven. In the center of the midfield, De Guzman was the heart of the Fury, circulating all its energy outward. Once fellow midfielders James Bailey and Jonny Steele get more settled, Ottawa could have a potent midfield. It’s probably going to take the entire Spring for that to happen, however. While Austin Da Luz was named Player of the Week by the league for his second straight game winner, I think Ben Speas deserves a little more attention. The central attacking midfielder put in a wonderful shift for Minnesota United against FC Edmonton. With an assist from rightback Kevin Venegas, Speas gave Minnesota the early lead and then a goal in the 55th minute to secure the win made the day his. In fact, Speas’ second goal was the kind that every soccer player and supporter dreams about–he passed the ball to himself (though, technically, rightback Kevin Venegas should should be credited for his second assist on the throw-in), spun around the defender, and then calmly slotted the ball passed the keeper into the back of the net. It is, as a highlight of individual skill, the second Goal of the Year candidate by a Minnesota United player. It was a difficult weekend for strikers. Although goals were scored, few were actually impressive. I blame Minnesota’s Christian Ramirez for this. His volley golazo from last week is still wowing me. However, after putting so much work last week but not really getting the credit for it on the score sheet, New York Cosmos striker Jairo Arrieta netted on a beautiful route-one play. You might think that if the strikers of the league had an off weekend, then it must be because the league’s centerbacks stepped up their game. Well, not so much. This weekend was about the midfield, specifically the defensive midfielders and the creative central attackers. But you gotta give love to the centerbacks that managed to keep their opponents from scoring. For me, even though they faced less than impressive attack Minnesota’s Brent Kallman and New York’s Jimmy Ockford put in more than respectable shifts.